Please accept my blessings. I am in due receipt of your letter dated 19th April, 1971 and have noted the contents. I have been so long in answering because just recently I went to Kuala Lumpur, Malaysia and Sydney Australia also, and have just recently returned to Calcutta. Here we held one Hare Krishna Festival as we held in Bombay, and it was even more successful. I am so glad to hear that you are doing so well in your German studies. If you become a German scholar, then I shall send you to Germany for preaching work. So far as controlling kama or lust, best thing is don't eat any highly spiced food stuffs and always think of Krishna. Chant regularly and get yourself married as soon as possible, and live a peaceful householder's life in Krishna Consciousness. Please accept my blessings. I thank you very much for your very thoughtful letters dated 21st April and 6th March, 1971 respectively. They were so much pleasing to me. I have just now received them, so there must have been some delay in the mail. Anyway, your kindly sentiments are very much appreciated. You are such a nice couple. I am always remembering how nicely you are preaching and helping me to fulfill the order of my Guru Maharaja. Thank you very much. May Krishna bless you both. I have received your gifts also and they are so very nice. Especially the bookmarks are such wonderful craftsmanship. The Deities jewelry is also very nice, and I can always use new sacred thread. Presently I am in Calcutta where we have just completed a huge Hare Krishna Festival in which 35,000 people gathered daily to hear discourses on Srimad-Bhagavatam and Bhagavad-gita to see arati ceremony and to take prasadam also. Such festivals are proving very successful, and so we are thinking of extending such programs. From here I shall be going to London via Bombay, or perhaps I may be going to Moscow if visas can be secured. From there certainly I shall be returning to U.S.A. and will be glad to see you both at that time. Please accept my blessings. You will be glad to know that I am starting for Bombay on the morning of the 31st May, 1971, at 9:00 P.M. on Indian Airlines, flight no. 130. So please attend the airport and pick me up. A telegram will follow. Please accept my blessings. I thank you very much for your kind letter dated 17th May, 1971 and I am appreciating it very much. So far as your joint application for my returning to U.S.A., you will be glad to know that by the middle of June I shall be returning and I am surely going to see you all then. Presently I am in Calcutta where we just held a very successful Hare Krishna Festival and we were drawing 35,000 people daily for hearing discourses on Srimad-Bhagavatam and Bhagavad-gita, for seeing Aratik and taking prasadam also. I will be staying here until the 31st instant and then will go to London via Bombay. From there I shall return to U.S.A. Hoping this will meet you all in good health. Please accept my blessings. I am in due receipt of your letter dated 4th May, 1971 and have noted the contents carefully. So far as the donated offset press is concerned, if it is being used locally, then there is no need of sending it to India. Go on with your work there. Regarding distribution of Spiritual Sky Incense profits to aleviate financial difficulties, you GBC members decide amongst yourselves as to the proper course of action and whatever you decide amongst yourselves, I have no objection. You will be glad to know that I have ordered 50,000 paperback KRSNA books. Rupanuga has expressed his opinion that we should get $1.95, but that is too much. I will make it $.95 instead of the $.75 originally proposed. We have just now concluded our ``Hare Krishna Festival'' here in Calcutta and it was very successful, even more so that in Bombay; daily 35,000 people were attending. Now we are wanting to make twelve such programs in the greater Calcutta area; one each month. In that way we will win over the city. From here I shall be going to London via Bombay or else to Russia. Then I shall return to U.S.A. Please accept my blessings. I am in due receipt of your letters dated 1st and 7th May, 1971, respectively and have noted the contents carefully. So far as Back To Godhead is concerned, the answers to your questions are as follows: Recipes are all right if you think that there is such a public demand. But just recipes, no pictures; Yes, parts of my letters may be reprinted as a second article by me; no drawings should appear in the magazine; Yes, a question and answer article is very nice, and letters from interested persons may also be published. On other matters you can use your own discretion. As of yet, I have not received the check for $50 for ten tulasi beads. Yes, if you feel that she is qualified, the girl Carol may receive Gayatri initiation also so that she can take up pujari business full time. So far as alleviating financial difficulty by dispersing spiritual sky incense profits, whatever the GBC members think is proper is all right by me. Your specific task is to regularly compile BTG and arrange editorials, etc. These are your business. On the whole, the report submitted by you for the Southern U.S.A. centers appears very favorable. Encourage them more and more. It is encouraging to note that the court case was won in New Orleans. Requirements for Jagannatha worship is that four qualified Brahmins must be on hand to tend to Lord Jagannatha's needs. Unless there are sufficient men and Brahmins, how can such worship go on? Regarding the proposed book "Method of Worship", I have not had time to prepare it here. So when I return to U.S.A. and again begin to write my books, my first business will be this. Enclosed please find some poetry by some of the devotees here. If you think that they are suitable for publication, then you may do so. Please accept my blessings. I am in due receipt of your letter dated 7th May, 1971 and have noted the contents carefully. So even though you are there by yourself, I can understand that things are going on nicely. And the Japanese boys and girls are taking a more responsible role in order to help you out. That is very encouraging. And soon Bhanu and Karatieya Maharaja will be there to assist you. You will be glad to know that Bhanu is now a complete devotee, that is to say he has received Gayatri mantra. So when he goes there both you and him can convert many young Japanese people to becoming Krishna Conscious devotees. I understand that you are needing one tape recording of Sri Isopanisad mantras, so I am recording them and they will be sent by separate post. You should be receiving it soon. Hoping this will meet you in good health and eager for Krishna's service. Please accept our prayers for your well being. Our society wishes to thank you for your kind cooperation in the past, regarding CCP application and import of books. As before, we wish to reiterate that the religious books received from either Japan or our New York Press, are gifts, and there is no intention to sell these books in India, nor is there any question of foreign trade in any of our activities. Again we are applying for CCP application for shipment of books statement enclosed worth Rs 50,000/- and we will be most happy if you advise and cooperate with us as you have already done. Please accept my blessings. I am in due receipt of your letter dated 19th May, 1971 and have noted the contents carefully. So far as the Deities are concerned, they should be repaired nicely and replaced on the altar. While being repaired, where is the question of offering? The picture on the altar is all right for the present. I am very glad to hear that Murari has returned and is working to pay off the money he had taken. And your scheme for making new members by plane chartering is proving to be successful, so continue it. You will be glad to know that very soon, within one week, Syamasundara. will be going to London, but my program is not yet fixed up. Please accept my blessings. Rupanuga Prabhu has recommended you for initiation and I am so glad to accept you as my duly initiated disciple. I have given you the spiritual name Kirtika Devi Dasi. Kirtika is the name of one of the gopis. Also your beads have been duly chanted on by me and are enclosed herewith. The gopis are so much engaged in the transcendental loving service of Radha and Krishna that they are condemning the creator, Lord Brahma for not knowing how to make perfect eyes. They were disturbed that when blinking their eyes, they could not see Krishna. 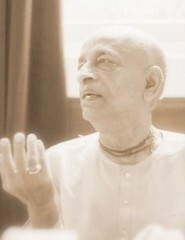 So that is perfection in Krishna Consciousness; to be so much engaged in Krishna's loving service that you cannot bear separation from that service, not even for a moment. So somehow or other always be engaged. And if there is nothing else, you can always sit down and chant Hare Krishna Mantra. 16 rounds daily is the minimal requirement, but you should chant Hare Krishna as much as possible. And follow all the regulative principles strictly. Read all our books, attend classes and go for street Sankirtana. In this way be engaged in Krishna's business 24 hours and you will be happy and in the end you will go back home, back to Godhead.